Lama Jigmé Jinpa (Dr Asa Hersh) is an ordained Ngakpa (white-robed Tantric Practitioner) of both the Kagyu and Nyingmapa lineages. He first took refuge with His Holiness the 16th Karmapa in 1980. In the same year, he met Kalu Rinpoche while on a pilgrimage to India, which eventually led to his undertaking the traditional lama training—the 3-year 3-month meditation retreat—from 1986-89. 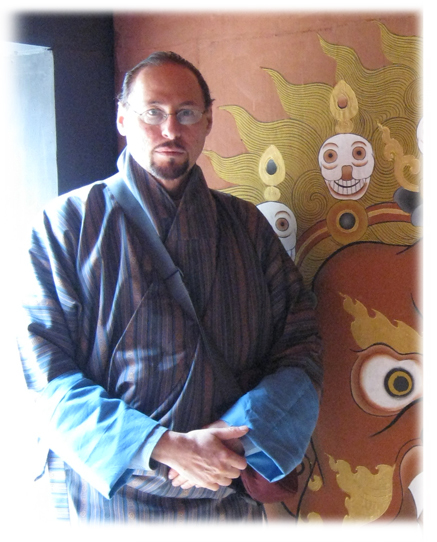 A seasoned chöpa, he has practiced Vajrayana for over 30 years. He combines his dharma background with 33 years as healer, teacher and author to make complex information accessible, dynamic and practical in daily life. Jinpa had been “bitten by the Chö bug” in 1980, when he heard Lama Namse perform this, while living at his dharma center in Toronto. Chod is a part of the dialy routine of 3-year retreat, and this deepened the connection and love for the practice. After his retreat, however, he avoided any specific dharma groups for over a decade, simply preserving his own inner work. But in 2004 he meet Kunzang Dechen Lingpa, and saving his life from a serious heart condition, began a three-year journey to help set up healing Chod rituals all over the country. Jinpa played “in the band” with the monks and nuns, journeying to Assam and Arunachel Pradesh on two ocassions. Currently he is authoring a number of Chöd realted books, including the definitive guide, Chöd: Cutting Through to Freedom, for Snow Lion, in order to spreading and preserve these traditions in an accurate and holistic way. Already a well-known Naturopath, Homepath and Chiropractor when he left his practice to enter the 3-year retreat, when Asa returned, he had a wealth of material to integrate. For 16 years previously, he had trained with Dr. John LaPlante, one of the most gifted psychic healers of our time. This had allowed Dr. Hershoff to develop an extraordinary sensitivity and healing ability. Currently, the focus of his medical work is the application of the 5 Elements to physical healing and in depth psychological transformation. Eventually the compilations of these traditional 5-element healing methods, gleaning from original Tibetan sources over three decades, will be published as the 5 Wisdoms, in several volumes. Over the years Jinpa has journeyed to India and Nepal over thirty times, studying with great masters such as Dilgo Khyentse and Kunzang Dechen Lingpa. His goal as a teacher and writer is to make the precious teachings accessible to Westerners, which led him to found the School of Tibetan Healing Chöd in 2006. Ever cautious and traditional, he only felt qualified to teach, some 20 years after his 3-year retreat training. He developed a unique curriculum that would teach all the oral and textual instructions that he had received over the decades, along with his own direct experience. Lama Jinpa is the main teacher for the School, providing a dynamic approach that combines the best of Western teaching methods and audiovisuals with the powerful blessing stream and energy of the authentic Eastern tradition. Jinpa is one of the extremely rare Western translators who combines accuracy with a literary style and poetic vision that reflects both the author and the nature of dharma. Additionally, he has developed the first system of transliteration that actually makes sense for the English reader with no background knowledge of Tibetan. This has made the liturgies and sadhanas of the Chod school and those of PeGyal Lingpa very accessible and easy to both use and understand. 1. Homeopathy for Musculoskeletal Healing. North Atlantic Books, 1999 (25,000 copies sold). 2. Homeopathic Remedies. Avery Books (Penguin Putnam), 2000 (35,000 copies sold). 3. Herbal Remedies. Avery Books (Penguin Putnam), 2001. 4. Hundred Thousand Rays of the Sun: Biography of Lama Tsering Wangdu, 2010. (editor and cover design).